Congratulations to ChrisBails, the winner in Dana's giveaway. Please contact JUST ROMANTIC SUSPENSE to claim your prize. Thank you to all who participated! When my current romantic suspense THREAT OF DANGER came out, one of the first reader notes I received was “It’s the funniest serial killer book I’ve ever read!” And my reaction was “Yesss!! !” Because that was the exact reaction I was hoping for. I try to balance out the dark with light. I try to put some of my favorite things into every book I write. For this book, it’s humor/friendship/family and…sugar. The story takes place on a maple syrup farm! Hey, everything doesn’t need to be serious. 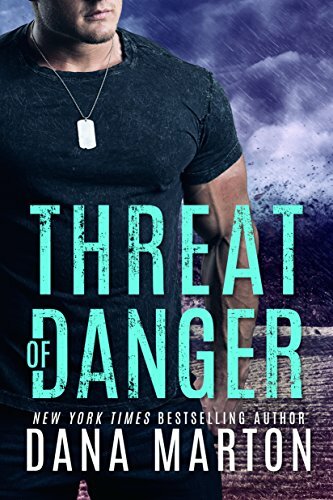 THREAT OF DANGER is about a top Hollywood stuntwoman who goes home to a small Vermont town, for the first time in a decade, when her mother breaks a hip. There was a good reason for Jess to run as far and fast from home as she could ten years earlier. On a romantic jaunt into the woods, Jess and her major crush/neighbor, Derek, were kidnapped by a serial killer. They escaped after three days of brutal captivity, but they never got over it. Jess became the most kickass person she could, and Derek joined the Navy SEALs. Both swore never to be a victim again. Jess plans on spending as little time at home as possible. When she runs into Derek and realizes the old attraction is still there, it throws her for a loop. But the stay is not all fun and games. The killer, too, is ready for a second chance. I didn’t want this book to be just another serial killer book. I wanted to give Jess something that she’s been missing for the past decade: family and friends. She’s been pretty lonely in Hollywood. So I built a community around her. Pam slowed even further and gulped air. “Hey, do we have to kill ourselves today?” She gulped some more oxygen. “We’re down to the last mile.” She took a moment to shoot Jess a thoroughly reproachful look. “I’m too young to cough up a lung.” More breathing. I hope you give these characters a chance. I promise you’ll be entertained! Wishing you a fun summer! Dana will be giving away a Kindle copy of SILENT THREAT to one lucky person leaving a comment or email entry. Giveaway ends 11:59pm EST June 29th. Due to GDPR regulations you no longer need to submit your email address in the comments. If you have been selected as a winner your name will be posted at the top of the post. You may then contact maureen@justromanticsuspense.com to claim your prize. Your email address will be shared with the author/publicist providing the giveaway. Fantastic cover. Added to must read list. Thank you so much, Chris!!!! Looks great! And I love that you added humor. Cops, detectives, and even agents usually do have a sense of humor; they have to. It's how they cope with all they have to deal with on a daily basis. Thank you so much for featuring this book and helping me get the word out. It's an honor to be a guest! I have got to read this book. For me humor is an important part of any story. As an Air Force wife during Vietnam and being around guys who go into combat, I learned that "gallows humor" is a necessary part of life for those who face life and death issues. The military, first responders, medical personnel all need and have wicked rather warped senses of humor. To an outsider it may sound callous and inappropriate, but at times it is so necessary to break the tension. Life can be hard enough. We don't need to concentrate on the bad or difficult. It is best not taken too seriously. You will enjoy it that much more.